A new device that fits on a cellphone could soon replace X-ray machines in airports and security checkpoints, while being affordable enough for schools and nightclubs. Rather than using X-rays, which often require heavy equipment, the new device, SWORD, uses radio frequency. The technology can achieve effects similar to X-rays, but in a noninvasive way, and with no more radiation than what a cellphone already emits. The SWORD platform would help move options for preventing terrorist attacks and mass shootings from being reactive to proactive, according to Barry Oberholzer, CEO of Royal Holdings, which created the system. Oberholzer said the system was an answer to threats he has witnessed in his work as an intelligence contractor. He has worked with the FBI Joint Terrorism Task Force, Belgium Customs Intelligence Agency, and others to counter criminal operations, including narco-terrorism and smuggling networks. SWORD works through a specialized smartphone case with an internal processor and antennae that emit radio frequency waves. These waves can scan people and bags, and transmit data back to the phone. It then runs the data through an app on the phone itself, which connects to an AI-driven threat database. 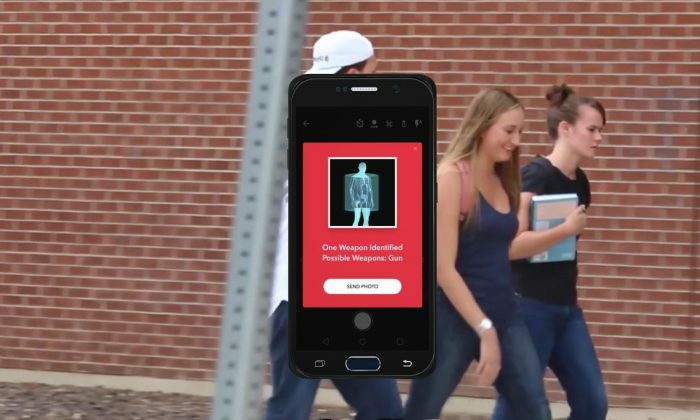 It can then give alerts on whether people are carrying guns or explosives, and can do facial recognition to detect if an individual is banned from a location or wanted by authorities. Oberholzer said the new system would give even security guards at locations such as airports and metro stations the ability to scan individuals and unattended bags for threats, rather than having to call in police, K-9 units, or bomb squads, which can often take hours.